None. Nicotiana is a warm-natured flower. Fast growth is encouraged by mixing a balanced organic fertilizer into the soil before planting. In midsummer, drench plants with a liquid fertilizer to stimulate late-season blooming. Lettuce, Cabbage, Cauliflower, Kohlrabi, Broccoli and Collards. Upright nicotiana combines well with mound-forming flowers like portulaca or lobelia. 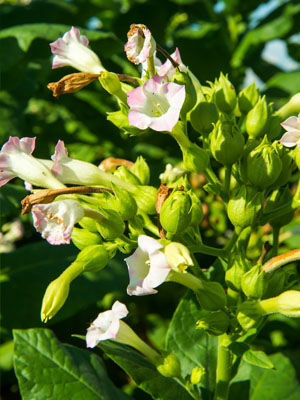 The tubular flowers attract hummingbirds, and many varieties are fragrant. Set out stocky seedlings from spring to early summer, after the soil has warmed. When starting the tiny seeds indoors, barely cover them with moist seed-starting mix. Nicotiana can be used as a trap crop from tomato hornworms. In midsummer, cut the plants back by half their size to quickly gather up hornworms eating the leaves. Very tall varieties benefit from staking. Nicotiana colors include white, pink, red, purple, lime green and yellow. As flowers fade, snip them off the flowering spikes with scissors to keep the plants looking neat. Aphids, slugs and both tomato and tobacco hornworms can require management. Some people are sensitive to nicotiana leaf sap and should dress defensively when working around the plants.